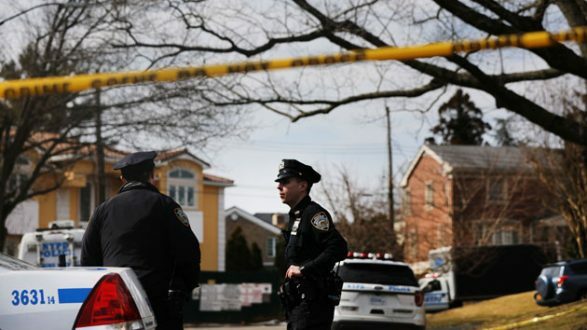 Spencer Platt/Getty Images(NEW YORK) -- The reputed leader of the Gambino crime family, once headed by infamous mobster John Gotti, was gunned down in a "well-thought-out execution" outside his New York City home late Wednesday -- sparking an investigation into whether the hit was sanctioned or the revival of a "mob war," sources told ABC News. As part of the probe, investigators are attempting to collect cell phone records to analyze as they attempt to identify the killer or killers, the source said. Detectives are also urgently reviewing security video from neighboring homes and other surveillance cameras that might show the killer coming or going from Cali's home in the Tote Hill area of Staten Island. Aerial footage from the crime scene taken by a WABC-TV helicopter showed police searching a silver SUV outside Cali's home with at least 17 evidence markers around it, some apparently noting the location of spent shell casings. It was not immediately clear if any surveillance cameras in the upscale residential neighborhood captured the shooting. Meanwhile, a federal indictment was unsealed Wednesday against Anthony Pandrella, an alleged Gambino family associate, charging him with murder in the killing of 78-year-old Vincent Zito, who prosecutors said was Pandrella's friend.